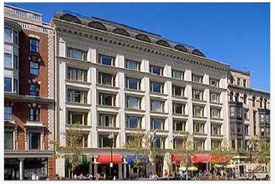 Office Building at 745 Boylston Street in Copley Sq. Boston leads New York, D.C., Chicago and L.A. not only in the bid for the 2024 Olympics, but also for CMBS loans. The Boston Business Journal is reporting the “percentage of Boston-area commercial mortgage backed security real estate loans with late payments is its lowest in months and is among the best in the country, according to new data from real estate information provider Trepp,,,According to Trepp, 2.84 percent of Boston-area CMBS loans were 30 days delinquent or more as of the end of November. A year ago, the rate was 4.02 percent. The decline has been more or less steady, with slight increases a few months…The Boston-area compares especially well with other major U.S markets. You can find more information on the BBJ’s website.